Libby Maynard relaxes with her Australian shepherd, Sky, in the kitchen of her renovated and expanded Vermont vacation home, just a few miles from Stowe Mountain Lodge’s base village. STOWE, Vt. — Five years ago, Nick and Libby Maynard had a happy decision to make: renovate and expand their house in Lincoln, Mass., or buy a vacation home in Vermont. It was an easy call for the lifelong skiers: Nick was raised in Manhattan and took frequent family ski trips to Vermont and Colorado as a kid, while Libby grew up skiing and racing in her hometown of Sun Valley, Idaho. They wanted to share their love for the sport with their three young children. So they set their sights on Vermont and started scouting for a ski town that would offer superior snowmaking and terrain, a solid weekend instructional program for the kids (who now range in age from 5 to 12), and enough cultural and recreational activities to keep everyone entertained year-round. Once they settled on Stowe, the house hunting got serious. 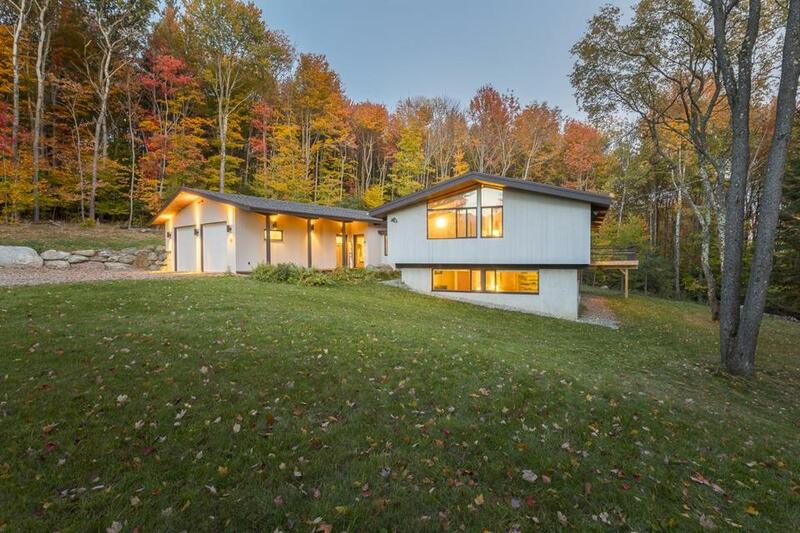 Nick is an architect — he graduated in 2001 from the Harvard Graduate School of Design and now runs his own firm in Lincoln — and he had clear criteria for their Green Mountain retreat. “It wasn’t financially feasible to buy a ski-in, ski-out place on the mountain,” he said, “so we started looking closer to town but still near enough that we could run home for the inevitable forgotten mittens, poles, or ski passes. We wanted enough room for our own family, plus guests and their families. And as an architect, I was looking for a house that was a bit of a project.” They also wanted a home with a modern, contemporary style. 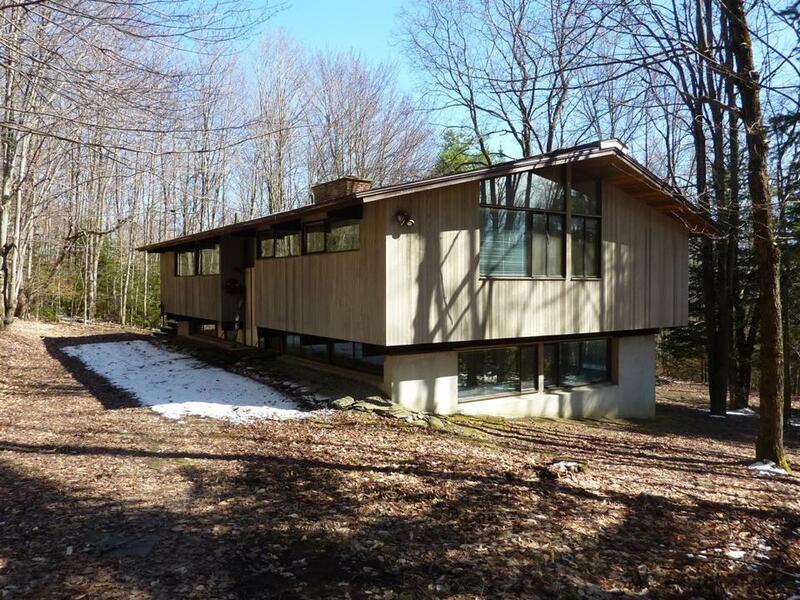 The search ended when the realtor found an original 1971 Deck House on eight acres just a few miles (a 10-minute drive) from Stowe’s base village. “People either love or hate Deck Houses. They provoke a strong reaction,” Nick said. “We really appreciate them. 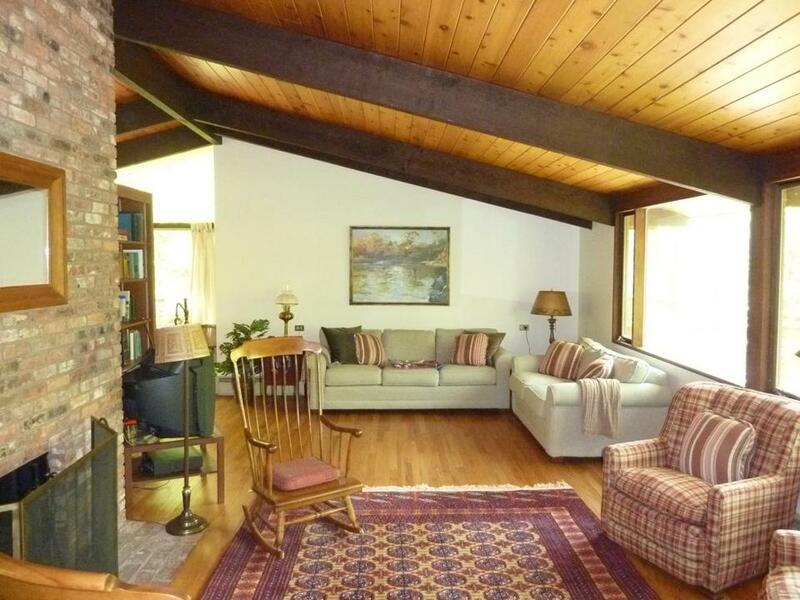 The house was musty and unlived in but basically well preserved and original.” They made an offer in April 2013. Deck Houses, a well-known line of prefabricated homes that date to the late 1950s, were invented by Boston architect William Berkes, who studied under German architect and Bauhaus founder Walter Gropius at Harvard. 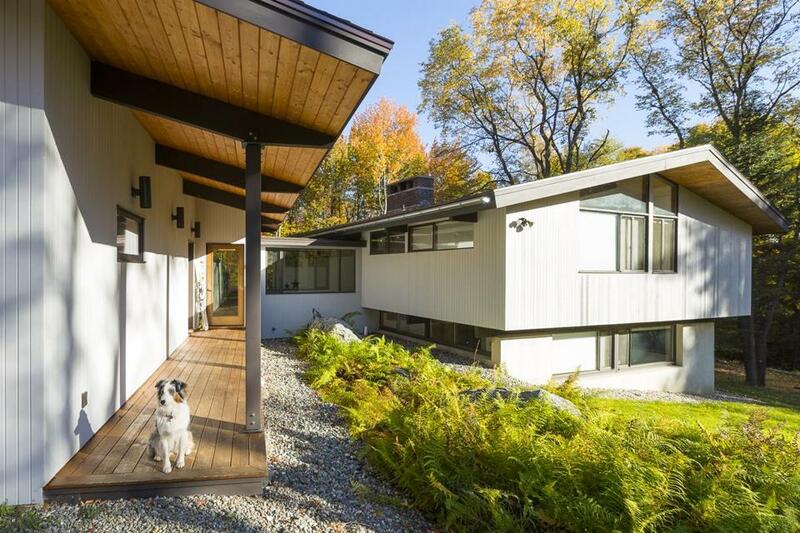 After working with prefab pioneer Carl Koch at Techbuilt, Berkes founded Deck House Inc. in 1959 to sell innovative homes made of components created in his factory and then shipped to the building site for assembly by a trained crew. 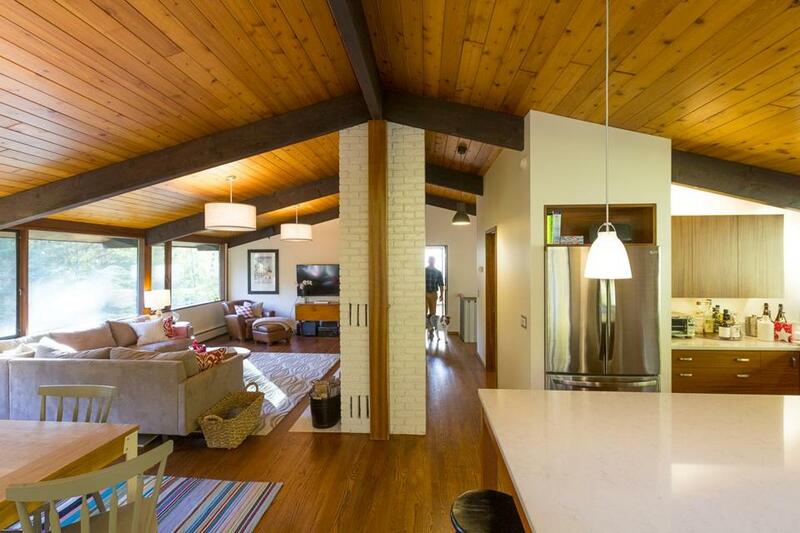 The signature Deck House components — then and now — include a sturdy exposed post-and-beam structure, a handsome structural tongue-and-groove Lock-Deck ceiling (hence the name Deck House), and floor-to-ceiling windows with mahogany trim. More than 20,000 of these homes have been built around the world, ranging in size from 1,000 to roughly 10,000 square feet. 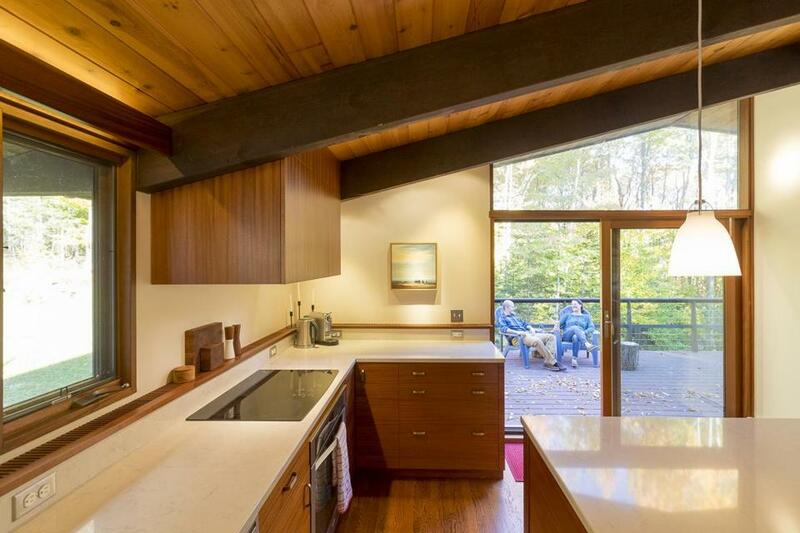 A 1962 neighborhood of 23 Deck Homes is still intact in South Lincoln, not far from Nick and Libby’s home and Nick’s architectural office (Maynard Design + Architecture). In fact, numerous Deck House neighborhoods from the 1960s, ’70s, and ’80s are still intact, including ones in Carlisle and Concord. In 1995, Deck House acquired Acorn Structures, and the firm was later sold and renamed Acorn Deck House Company, with its manufacturing facility and corporate headquarters in Acton. “People sometimes do really incongruous renovations or additions to Deck Houses — usually because they didn’t really want a Deck House to begin with,” Nick said. 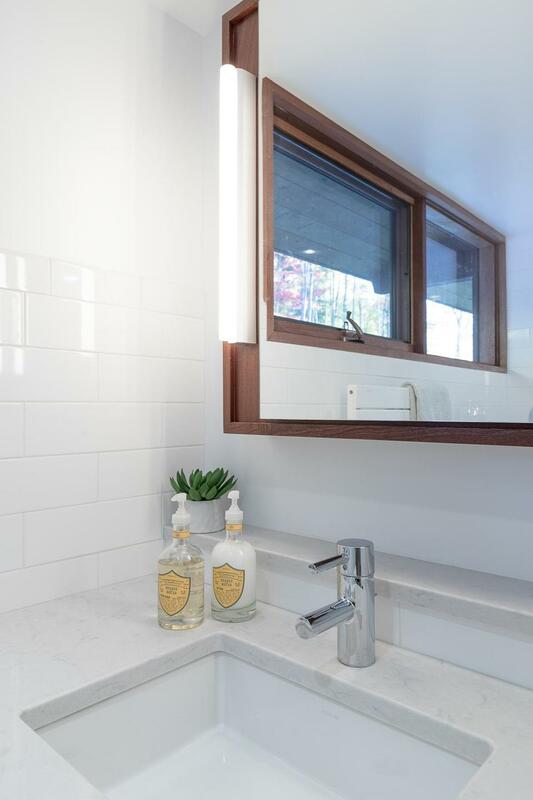 His goal was to reconfigure the living space and to add a spacious mudroom and garage while preserving the design aesthetic and clean, simple lines of the home. 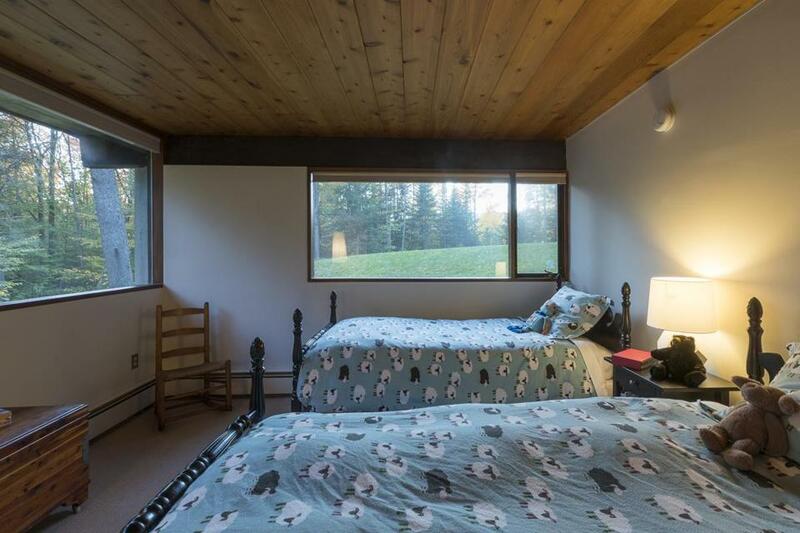 The new addition also includes a half bath with the same easy-to-mop concrete floor, which comes in handy when the kids — already zipped and buckled into ski gear and boots — need a last-minute bathroom break before heading to the slopes. It’s also useful when “you’re outside shoveling or chain-sawing,” Nick said. “You can duck into the bathroom while wearing your boots.” The finishing touch is an oversized heated two-car garage with a slightly sloped floor that funnels melting snow down a central drain and plenty of room for skis, sleds, bikes, and firewood. On the other side of the new entry, a classic split-level stairway leads a few steps up to the main floor. To the right, two bedrooms share a full bathroom that has been fully renovated with a glass-and-tile shower, radiant stone floors, Silestone counters, and a floating mahogany ribbon-stripe vanity. 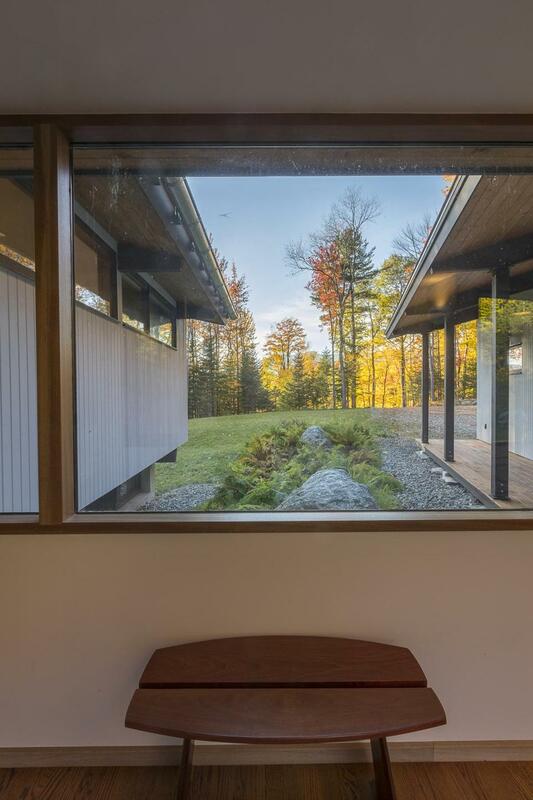 To the left, an open family room, dining area, and kitchen are framed by expansive windows that look out over a large uncovered deck to a sloping lawn. 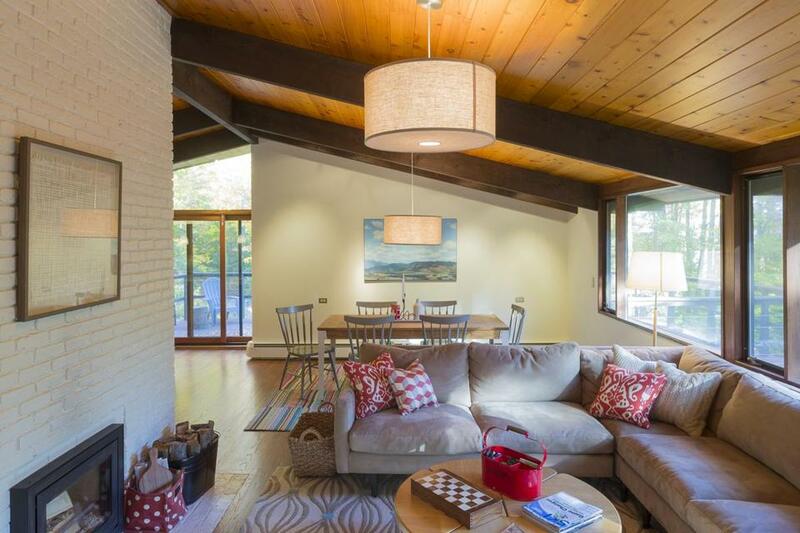 This central living space, the heart of the home, was an important part of Nick’s renovation. In winter, extra heat is provided by a small wood-burning insert that replaced the original fireplace. It has a secure door and no flue to open and close, so there’s nothing to worry about, Nick said. “We can have a fire on Sunday afternoon, leave for Boston on Sunday night, and not worry about anything rolling out of the fire grate.” They also increased the home’s efficiency by replacing several original windows and sliding-glass doors with the latest high-quality insulated Deck House versions, which Nick picked up at the factory in Acton and drove to Vermont on a trailer. The most energy-efficient improvement, however, was the addition of 8 inches of rigid insulation to the roof. “It’s like a nice, warm hat,” Nick said. Downstairs, the project mostly involved sprucing up the two bedrooms, full bath, and living room that doubles as a playroom for the kids, with a foosball table and big flat-screen TV. They also converted the old utility room into a bunkroom that sleeps four. The Maynards wrapped up the renovation in January 2014, though “as an architect, you’re never quite finished,” Nick said. “But it accomplished our goal, which was to make skiing a central part of our winter routine. From Christmas to March, we’re up in Vermont every weekend.” The drive takes less than 3½ hours. 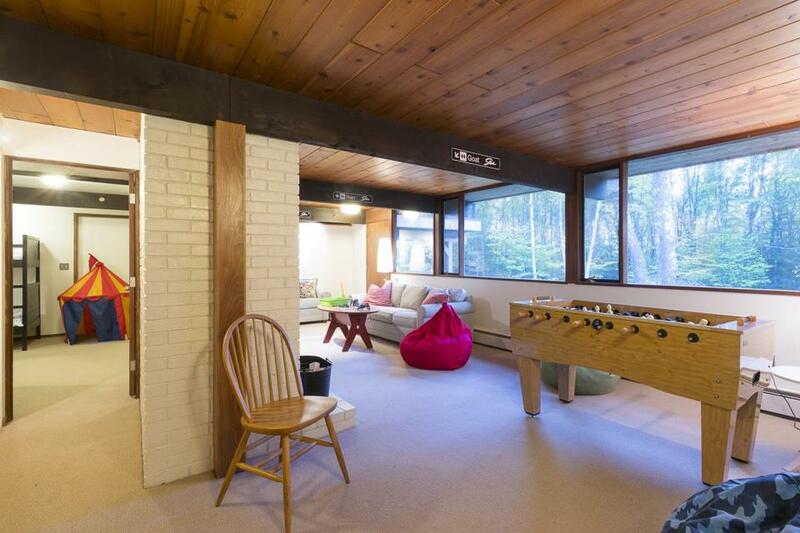 BEFORE: The Deck House was built in 1971. AFTER: The renovation project included an addition with a mudroom, breezeway, and garage. BEFORE: The living room was closed off from the kitchen. AFTER: The redesign opened up the layout, connecting the dining area, living room, and kitchen. 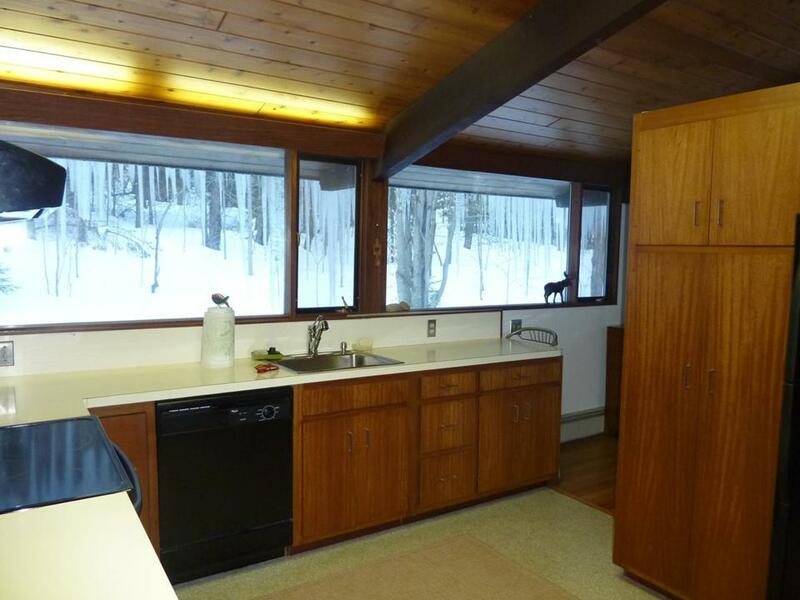 BEFORE: They converted part of the old kitchen, seen here, into a laundry room. 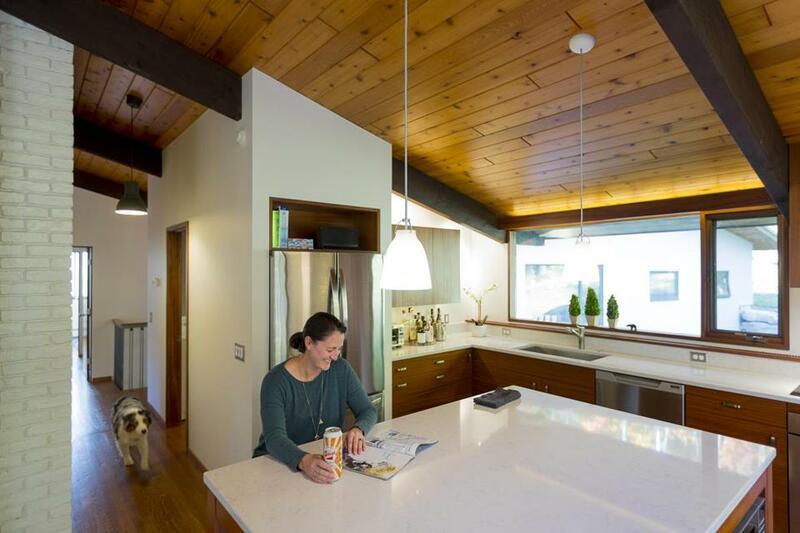 BEFORE: “We wanted a modern, efficient space — an open kitchen where you can easily communicate with everybody else and a dining room immediately adjacent, which makes it easy to feed the kids,” homeowner Nick Maynard said. 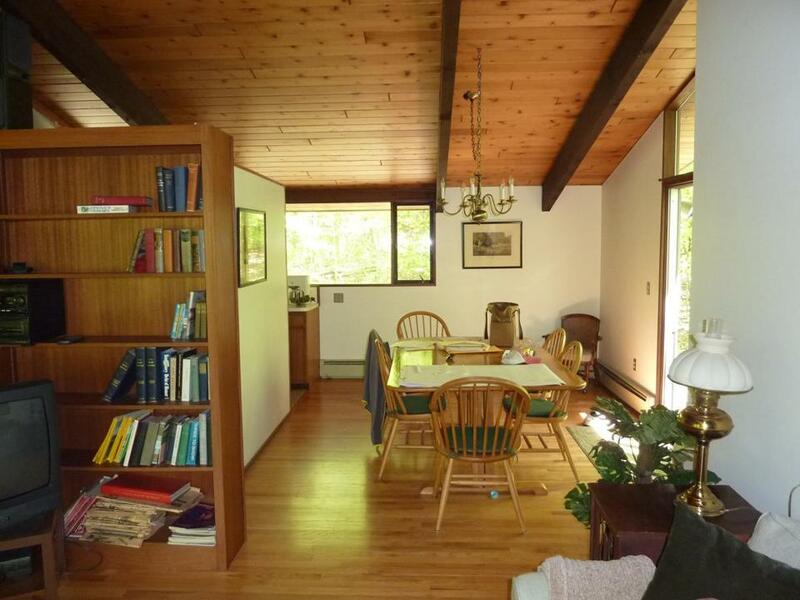 AFTER: An open family room, dining area, and kitchen are framed by expansive windows that look out over a large uncovered deck to a sloping lawn. AFTER: They ripped out the partition blocking of the old kitchen to create a spacious new kitchen with a central island for storage and seating. 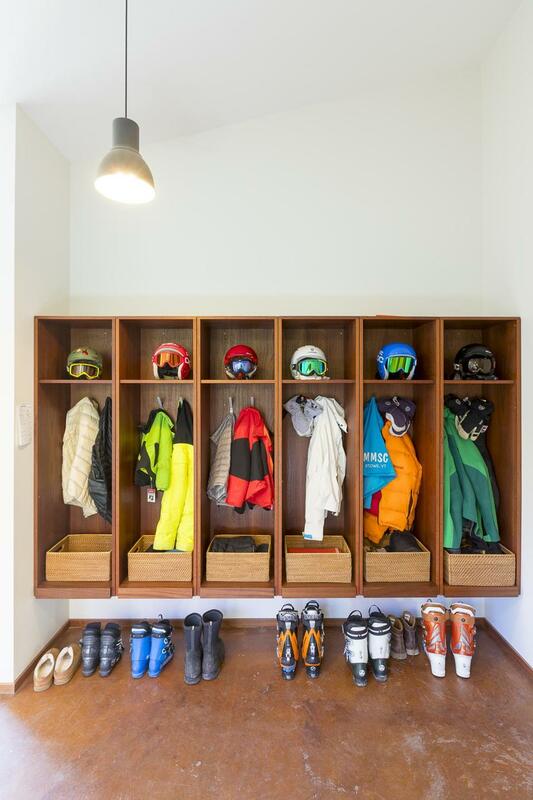 Ski gear is stored neatly in the new mudroom, which has a stained-concrete floor with radiant heat. The home now has seating to slip off boots without making a mess of the rest of the house. A view of the new addition and updated exterior. 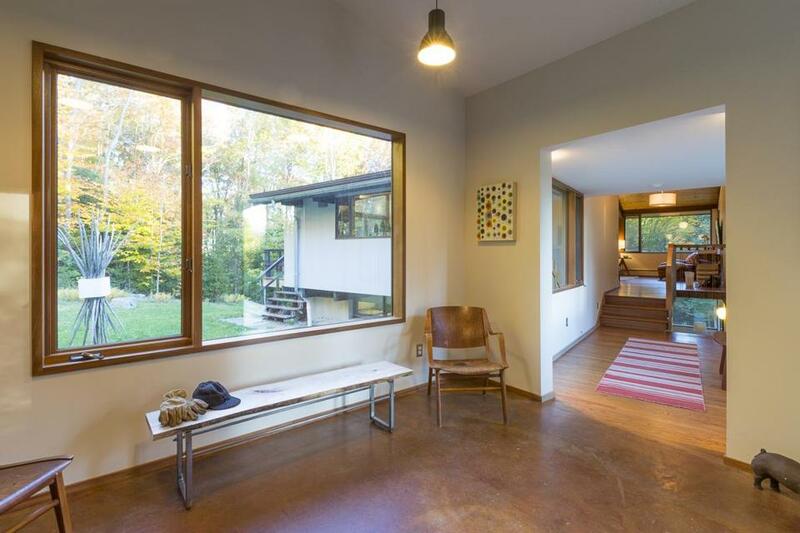 They also increased the home’s efficiency by replacing several original windows and sliding-glass doors with the latest high-quality insulated Deck House versions. Downstairs, the project mostly involved sprucing up the two bedrooms, full bath, and living room. They also converted the old utility room into a bunkroom that sleeps four. 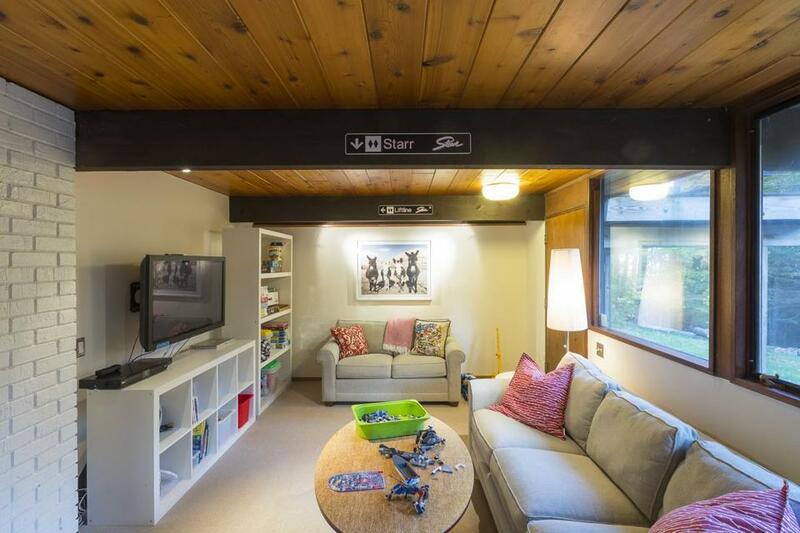 This downstairs living room doubles as a playroom. One of the updated bedrooms. “We wanted enough room for our own family, plus guests and their families,” Nick Maynard said. Sky, who is 1 year old, greets a guest from the addition. Kathleen James is the editor of Skiing History, the bimonthly journal of the nonprofit International Skiing History Association. Send comments to kcjames@comcast.net.